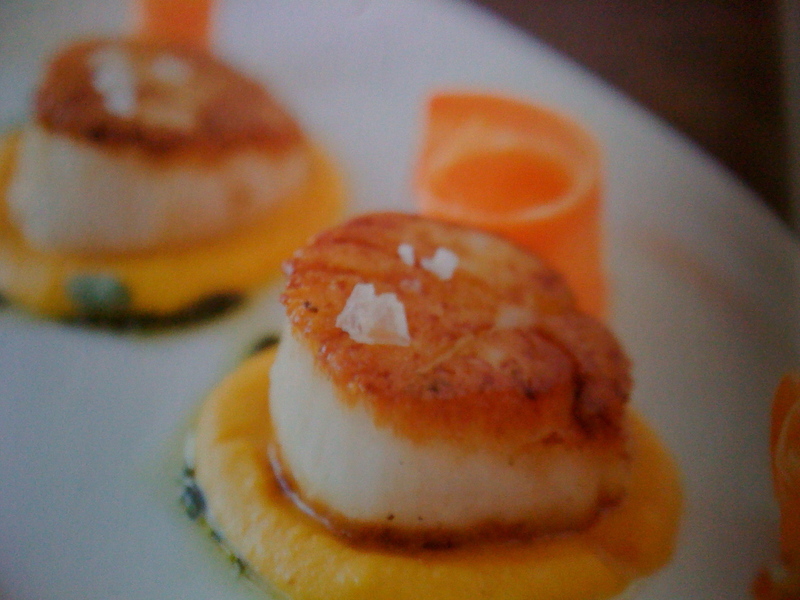 The scallops section opens with a two-page spread devoted to tips for searing scallops. (You can also go to the video: www.goodfishbook.com.) I’m scared of high heat, so I really meditated on this tip sheet. Plus, I’ve never cooked a scallop in my (long, long) life!–But we’ll be fine; just listen to Becky. Let’s take stock here. To cook this dish, we are going to make a carrot cream, we are going to pickle some carrot strips, we are going to make an herb oil, and to top it off we are going to garnish the whole thing with some fresh marjoram leaves. And of course cook our scallops! Becky’s recipe talks about the herb oil last, but (partly to postpone the showdown with the scallops) I’m going to move it up ahead of cooking the shellfish. Put the carrots and salt into a medium saucepan, cover them with water, bring the pot to a boil, and cook until the carrot pieces are tender (7 or 8 minutes). (I turned the heat down a bit once they began to boil.) Drain them, put them in a blender with the cream and pepper, and blend them until you have a very smooth purée. That’s it! 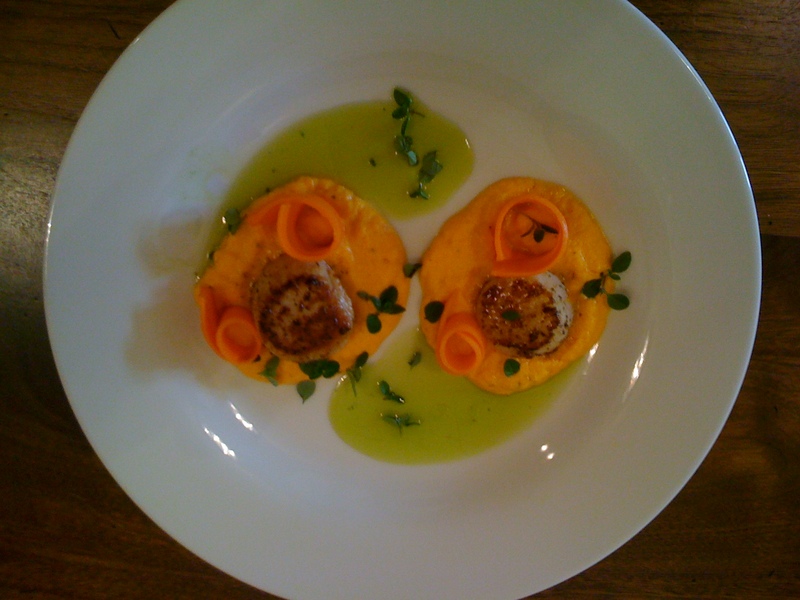 Set them aside until you are ready to plate the scallops. This has been a bad summer for my garden (sun? heat? no such luck). But my back deck does better than anyplace else in the garden, so my herb pots are flourishing. Which means I strolled out to the deck and pinched off a generous handful of fresh parsley and marjoram leaves for the herb oil and the garnish. Nice. In a blender, combine the parsley, marjoram, olive oil, vegetable oil, and salt. Blend until the oil turns a vibrant green color, about 3 minutes. You can strain the oil through a fine-mesh strainer if you’d like, or leave it with some texture. Transfer it to a bowl or squeeze bottle. Here we go. 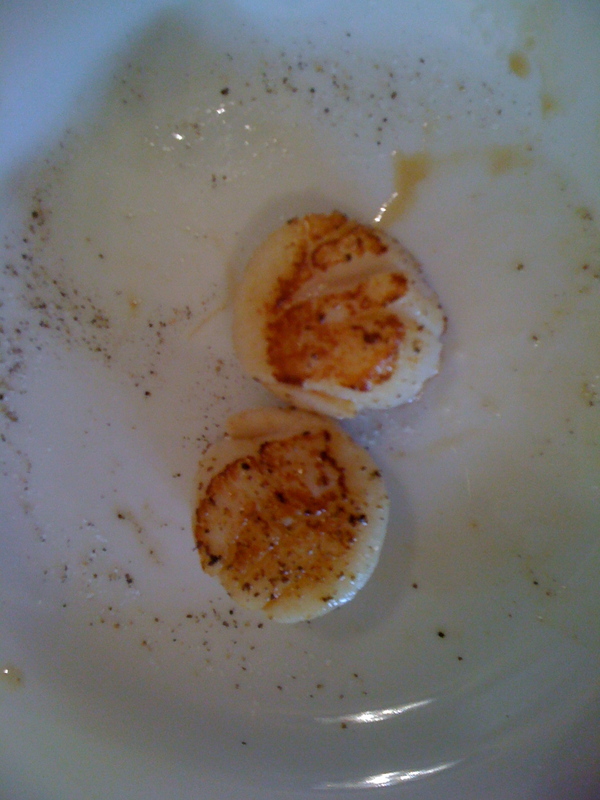 Becky’s instructions: “To prepare the scallops, dry them with paper towels. Place them on a plate and season generously with salt and pepper. Heat a heavy skillet over high heat. Add the vegetable oil and, when it is really hot, carefully add the scallops to the pan, being careful not to splatter oil on yourself or crowd the pan with too many scallops. 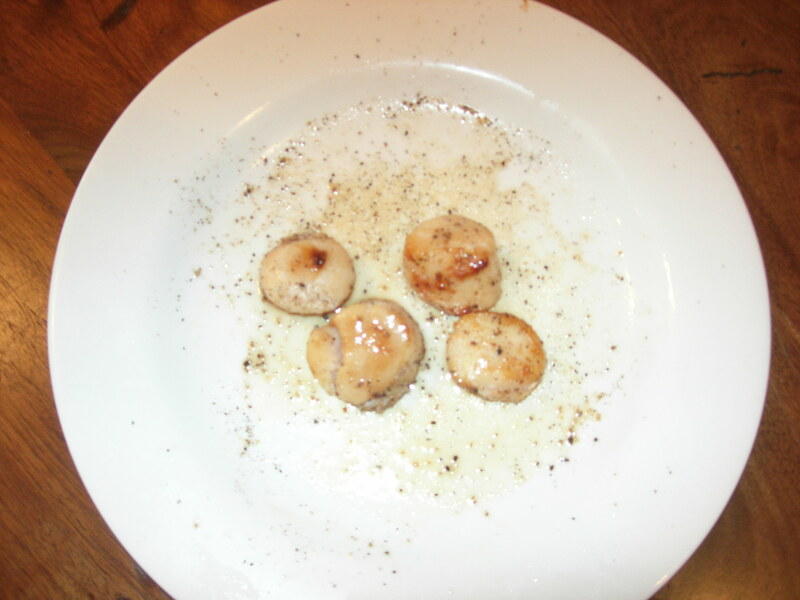 Cook the scallops for 2 minutes on one side without disturbing them, or until they are caramelized, then flip, cooking the other side for only a minute or so more.” Before you get going, watch the video; it helps a lot. I didn’t (the first time through). 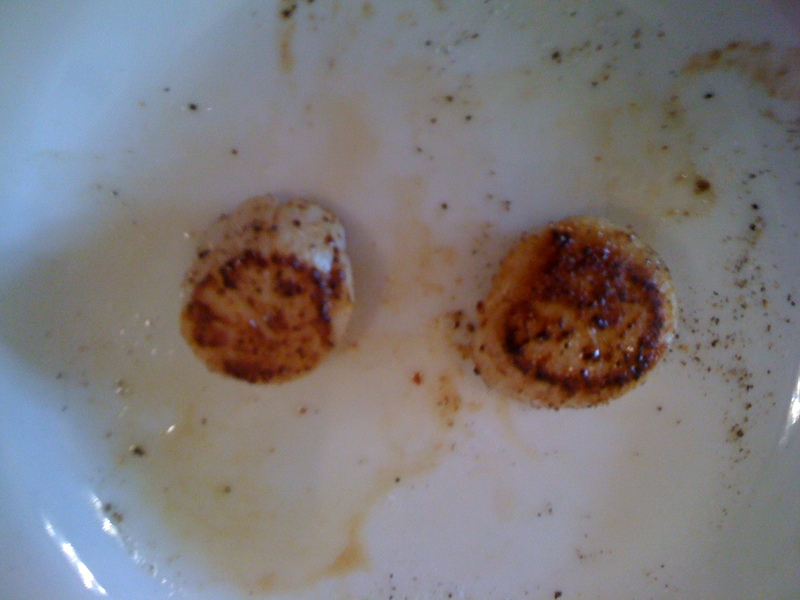 Plus, I did exactly what she warns us not to do–I dialed down the heat before I even put the scallops in the pan. So, to get some color on them, I left them in there for oh four minutes or so. Rubber! 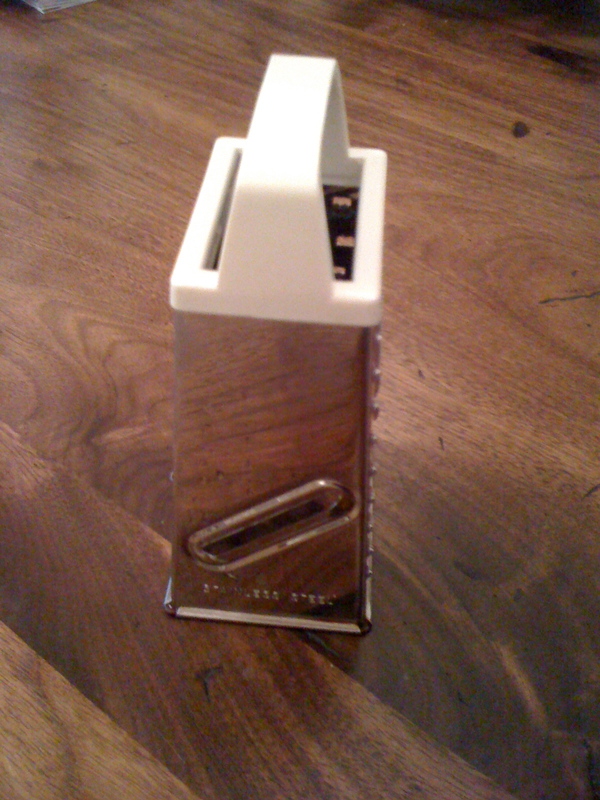 Say hello to the most expensive erasers you ever saw. But let’s move on. A few days later (carrot cream, pickled carrots, and herb oil waiting in the fridge) I tried again. The second try was not bad; I still didn’t have the pan hot enough to get a really thorough sear on both sides, but they tasted pretty good. So I went for one more try, this time using grapeseed oil and my heaviest cast-iron skillet. Fire it up to high!–Don’t flinch! (I found it helpful to yell “Gaaaaa!” as my bare fingers placed the scallops into the slightly smoking pan.) Still not as pretty as Becky’s picture, but closer. And they had more crunch and texture, plus I swear they tasted sweeter and brinier for it. So now to attempt to copy Becky’s fantastic presentation. It turns out that you can make the carrot strips curl by . . . well, curling them up. Once you anchor them in the carrot cream, they don’t uncurl too much, and look very pretty. Spoon on some oil, scatter some marjoram leaves. And then eat!